Natural play spaces – by design? It’s likely that most outdoor play happens in ‘natural’ places, but that’s not to say that this is any better than playing on play equipment or in conventional, designed playgrounds. These defined ‘children’s spaces’ make children feel they have permission to be themselves, have fun and are valued – however, they are usually adult- created places. Equally we don’t need to think that every aspect of the playground needs to be ‘manufactured’ or protected; sand or bark are as effective as rubber safety surfacing. And perhaps we don’t need to fence everything in – though this probably gives a sense of security to parents of the youngest children. Children will naturally gravitate to natural places to play; they are seen as more likely to be free from an adult agenda, free – creative – self-directed. We need to understand the importance of the natural environment and be prepared to protect, expand, leave it alone and ensure variety. There is a need for specialised/dedicated training. So, can designed play spaces be in any way ‘natural’? There is scope for bringing together the best of ‘off the shelf’ play equipment and those which use natural materials, objects and environments – or perhaps are an artful interpretation of these. The best play spaces are unique and valued by their community. A design -led approach which combines play features custom-built for their location, with ‘off the shelf’ play items like slides, climbing frames, swings and zip wires is a key interest of mine. I’ve included a few pictures of some of my own work in creating these ‘play landscapes’. 1. Making the most of natural features– fallen trees to climb, clumps of tough plants for building dens, slopes to roll down, small things like piles of grass clippings and places that encourage insects and other critters (e.g. the ‘nectar bar’ shown in one of the photos). 2. Land sculpting – do you live in a pretty flat landscape? Introducing some variation in the play area by sculpting the land into ditches and hills provides endless fun for children of all ages. 3. Boulders – these are becoming a feature of many play areas, but often lack the size and careful placing to make them a good play feature (as stepping-stones, or for clambering up for example). Ideally they need to be of a smooth granite for ease of climbing and to avoid dangerous sharp edges. 4. Sand – there is an ‘urban myth’ that sand pits attract cats and other animals who use it as a toilet. Though there are examples of this as an issue (and possibly also from vandals leaving cans, bottles and other rubbish in them)- the benefits of sand as a play medium usually far outweigh the possible risks, especially if they are inspected daily to remove any offending items. Sand can be used as a safety surface also though not where rubber or other matting is more practical or where children playing in the sand risk being knocked over by those using some equipment (e.g in the area at the end of a slide). And why not go one stage further and create/designate a muddy/digging area? 5. Trees– either naturally fallen or imported, dead trunks provide great climbing, sitting and ‘hang out’ areas. Some larger living trees are suitable for climbing or having rope swings attached.Planting groups of new trees is also a good idea, but these should be out-of-the-way of key play features, in areas where the temptation to uproot them is minimised! Where you can’t have natural trees, it’s possible to create tree-like structures to climb (see pics). 7. Water– surely a no go for children’s play? Well, once more it’s easy to over react and miss what can be a wonderful play opportunity. Rather than ban any water we should think about how it can be safely included in a play landscape – from a hand pump combined with sand play/mud perhaps (see pic), or in a shallow canal or stream…. 8. 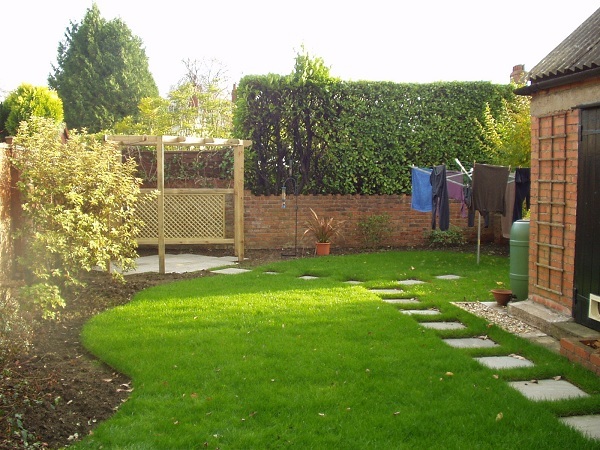 Grass– introduce areas where the grass is not cut as frequently so as to vary the play landscape. Children love long grass – it seems more ‘jungly’ as one youngster commented to me! So there are practical ways of creating interesting, naturalistic ‘play landscapes’ which avoid the one size fits all mentality so often applied to play areas (or ‘KFC’ = Kit – Fencing – Carpet). In tomorrow’s post – how to secure more natural play for your children- ten tips for parents. Love the earth sculpting, can just see it in our Children’s centre garden, appeals to my philosophy for outdoor play in early years and reflects what we aim to achieve for the children! Look forward to reading your blog! Thanks Lyndis, that’s kind. There’ll be another post on natural play Thursday, so please come back and tell me what yout think! And let me know about what you’re doing too! I love this! I persuaded my husband to build a little mound in our totally flat garden. Although it looks a bit bonkers our two small boys have rolled down it, jumped off the back of it, biked down it, sledged on it, thrown paper planes off the top etc etc endlessly. It is one of their favourite bits of the garden. Will definitely try to incorporate some of your other ideas too. Many thanks, Daisy. I love your story and it shows how the simplest of ideas can make great play landscapes! I’d love to hear more about what you’ll do in your garden.